The European starch industry produces over six hundred products, from native starches to physically or chemically modified starches, through to liquid and solid sweeteners. The versatility of starch products is such that they are used as ingredients and functional supplements in a vast array of food, non-food, and feed applications. From 75 starch production facilities in 20 of the 28 EU Member States, the European Starch Industry today produces 10,8 million tonnes of starch each year from EU wheat, maize and potatoes. EU consumption of starch and starch derivatives was 9,4 million tonnes in 2017. Starch Europe members constitute more than 95% of EU starch production. The 26 Starch Europe member companies process starch in 75 plants in 20 of the 28 EU Member States. They process about 24 million tonnes of agricultural raw materials (17 million tonnes of cereals and 7 million tonnes of starch potatoes) into 11 million tonnes of starch and 5 million tonnes of co-products. EU starch production has increased from 8.7 million tonnes 2004 to 10,8 million tonnes in 2017. The EU consumes 9,4 million tonnes of starch (excluding starch bi-products totalling around 5 million tonnes), of which 58% in food, 2% in feed and 40% in non food applications, primarily paper making. 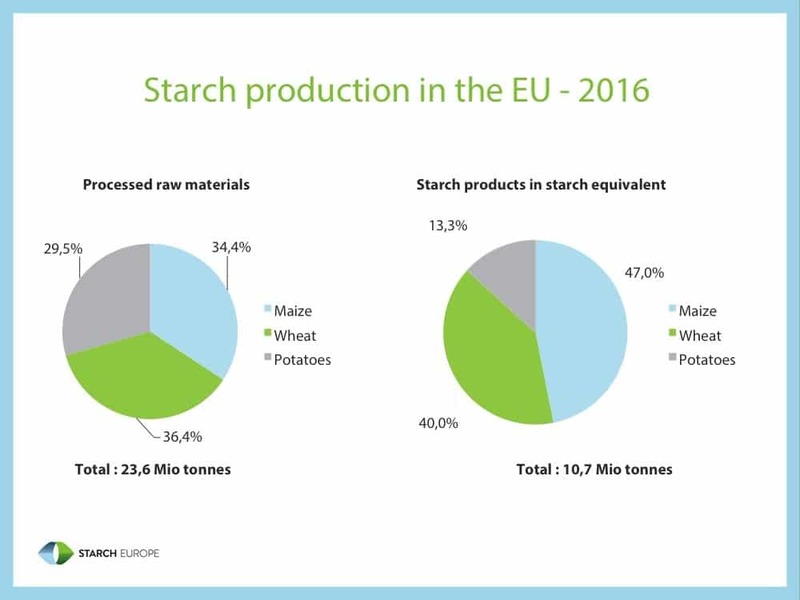 Of the 9,4 million tonnes of starch and starch derivatives consumed in the EU, 27% are native starches, 19% modified starches and 54% starch sweeteners. Although the early history of starch use is mainly unrecorded, some very early examples of its industrial use are documented. Reference to strips of Egyptian papyrus being stuck together with a starchy adhesive date back to 4000 BC. In 170 BC Cato described a process used by Romans for separating starch from grain and around 312 AD starch was shown to provide resistance to ink penetration in Chinese paper. By the 16th Century starch was being widely used in Western Europe, primarily in the textile industry as a stiffener. Until the 1970s most of the EU starch which was not made from potatoes was made from imported maize (primarily) and wheat from the United States. With the advent of the EU’s Common Agricultural Policy however, the EU became largely self sufficient in wheat and maize and EU starch today is produced almost exclusively from EU agricultural raw materials. Whilst some wheat and maize starch companies are also agricultural cooperatives, the majority are privately owned.